Midway through “The Prizefighter and the Lady”, when the aspiring heavyweight champion of the world Steve Morgan (Max Baer) is at peak fame, he joins a stage revue. And for almost six minutes, director W.S. Van Dyke stops the movie in its tracks to join this revue too, watching Steve and a dozen or so dancers as they sing and rollick their way through a variety of moving sets. It’s not hard to tell how much fun Baer the actor has during this sequence, and as I watched it, I thought about “Cinderella Man” (2005). After all, “The Prizefighter and the Lady” was released in 1933 and in 1934 the real Baer beat the real Primo Carnera (also starring in the film as a version of himself) for the Heavyweight Championship and in 1935 Baer lost the Heavyweight Championship to underdog James J. Braddock, “Cinderella Man” himself. And while The Depression was very much present in the latter, casting Braddock in the appropriate underdog light, you hardly feel The Depression at all in “The Prizefighter and the Lady”, which transforms its own fictional underdog story into a cautionary tale of excess. “The Prizefighter and the Lady” opens with a broken down ex-boxing manager, The Professor (Walter Huston), drunkenly reminiscing about the past only to see the future right in front of his eyes when Morgan, a bar bouncer, demonstrates his right hook in ridding the place of some lout. The Professor convinces Steve to enter pugilism on the spot which the bouncer blithely rolls with, an attitude that Bear embodies with great aplomb. Even upon discovering before his first fight that his guiding hand might be throwing him to the wolves, Baer counteracts his initial malice by throwing his enomormous arm around The Professor with a distinct jocularity, rendering his imposing physicality in the name of humor. He’s not taking it that seriously, and he doesn’t take it that seriously inside the ring, clowning and boxin in equal measure, a reflection of the real Baer’s fighting style. 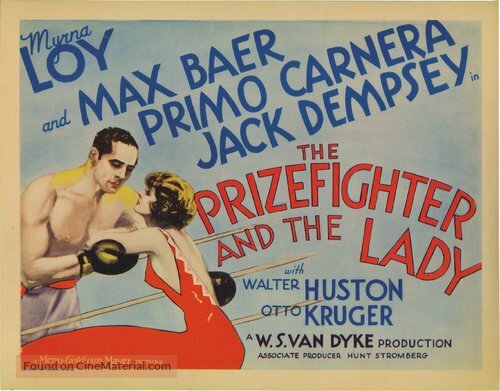 He takes boxing only slightly less seriously than he seems to take his (brief) relationship and subsequent marriage to nightclub singer Belle (Myrna Loy), who he rescues from a car wreck and falls in love with instantly, though she is already the squeeze of ganster Willie Ryan (Otto Kruger). She spurns Steve’s advances but he keeps at it, not so much winning her over as just sort of mystically marrying her. I say mystically because their marriage happens offscreen after, like, a day or two of pseudo-dating. That offscreen ceremony might yearn to drum up suspense involving the incensed Willie Ryan, still stung from Belle breaking up with him for this boxer, but aesthetically it seems to stem from the movie moving so fast narratively it doesn’t have enough time to render it believable. Even Loy, whose gloom when her character’s heart is broken moves the needle, struggles in these moments of falling in love, not least because Baer struggles as a scene partner, too stiff where romance is called upon, his lines sounding as if they are coming right off a script. This makes the push and pull of Steve and Belle’s marriage a little less than credible, which makes the aforementioned cautionary tale, as Steve’s dalliances with other women threatens to break up their union, resonate far less. If you might think the real Baer would have read this script and come away thinking that between his bouts with Carnera and Braddock, he should not take his eyes off what really mattered, well, the way Baer goes through the marital motions but lights up in that stage revue foreshadows precisely what was to come. 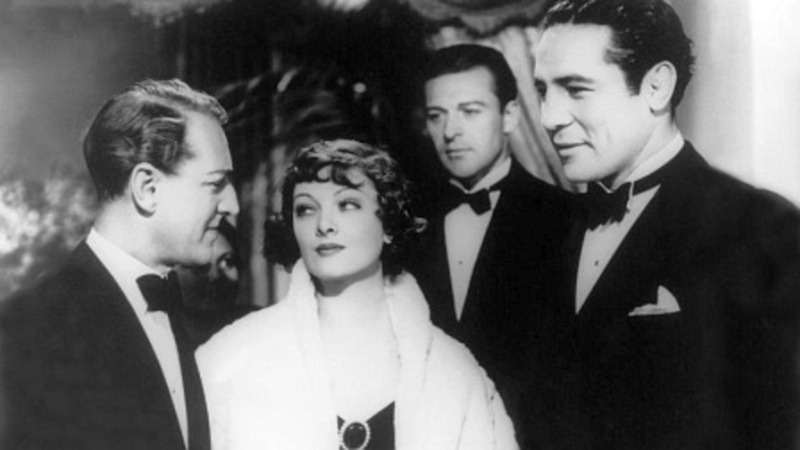 Legend has it – or at least, Myrna Loy has it, according to an interview she apparently once gave – that Baer defeated Carnera on the strength of tips he acquired during filming of “The Prizefighter and the Lady.” Who knows if it’s true. But it does make for a good story. And the fight makes for a good piece of filming that is sort of staged half au naturale. That is to say, Van Dyke does not go straight into the boxing. No, if he cedes the film for six minutes to a song and dance, here he cedes the film for a few more minutes to the ring referee, who goes through a long list of special guest introductions, including former heavyweight champions Jack Dempsey and James Jeffries. These are not cameos with any kind of creative purpose; these are cameos for the crowd. And even if the fictional fight between Steve and Carnera, which concludes in the manner of “Rocky”, is tightly edited, it reminds you of the original purpose of the movies. Nowadays you can pull up a Baer right on YouTube, but back then if you couldn’t get a ticket to Baer vs. Carnerna, well, you could go see them fight in “The Prizefighter and the Lady” instead.